Improve your chances of an early breast cancer diagnosis, treatment and cure with self-examinations and clinical breast exams. A self-examination can help diagnose breast cancer. A clinical breast exam should be part of your annual well-woman checkup and performed by your doctor. A mammogram is a breast X-ray that can show small, early-stage cancers. Our 3D mammography equipment is the most effective tool to detect breast cancer before lumps can be felt or cancer symptoms appear. Early breast cancer detection helps provide a woman with more treatment options and increases the possibility of a favorable prognosis. Radiation exposure during a mammogram is low, about the equivalent of a dental X-ray. Mammography can be uncomfortable or painful for some women, but adjustments can be made to reduce your pain. Women with average breast cancer risk typically begin annual mammograms at age 40. Women in their 20s and 30s should have clinical breast examinations during physical examinations. 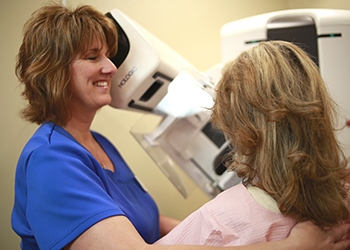 We perform screening and diagnostic mammograms depending on a patient’s medical history and breast symptoms. Appointments can last up to two hours, depending on the mammogram performed. If you are 65 or older, or if you’re younger than 65 but have one or more of the risk factors associated with osteoporosis, you should have a bone density test. To screen for osteoporosis, the physicians at The Women's Clinic measure your bone density with a low-level X-ray machine that determines the ratio of minerals in your bone tissues. This comfortable, non-invasive test requires you to lie on a table as a scanner is passed over your body; this diagnostic tool is usually only used to check hip, spine, and wrist bones. If you’re diagnosed with osteoporosis, your doctor at The Women's Clinic probably will recommend lifestyle changes along with medication to help prevent fractures. Bisphosphonates are a type of medication that can prevent and treat postmenopausal osteoporosis, while calcitonin is a natural hormone that can help slow the rate of bone loss. Hormone replacement therapy can also prevent further bone loss. Your doctor will design a treatment approach that’s right for you.